Amaranthus gangeticus growing herbaceous of the genus Amaranthus and also known as Elephant head amaranth, Amaranthus gangeticus shot perennial evergreen or in cold weather an annual plant, it’s edible plant and mostly used as ornamental plant, grow in mediterranean, subtropical, temperate, tropic climate and growing in hardiness zone 2+. 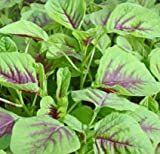 Leaves edible in oval shape, the leaves color can be: green, purple or something in between. Flowers small purple or red and grow on inflorescence stalk, the seeds are also edible.